Every city has a Fortitude Valley. It’s simultaneously the cultural hub of the city and the dodgy part of town your parents warned you about. It's pulsing with live music and street art and it's home to the greasiest kebabs you'll ever eat. The number of op shops is matched only by the number of strip clubs, and the coolest venues that have been there for years are next door to that nightclub that's changed name 18 times over the past decade. The weathered hotels and deeply-entrenched convenience stores remind the shiny new eateries and boutiques that this town didn’t pop up overnight. It’s seen stuff. Brunswick Street transitions from tattoo studios and art spaces to the gritty buzz of the mall, to the quiet, suave stretch of road reaching towards New Farm. 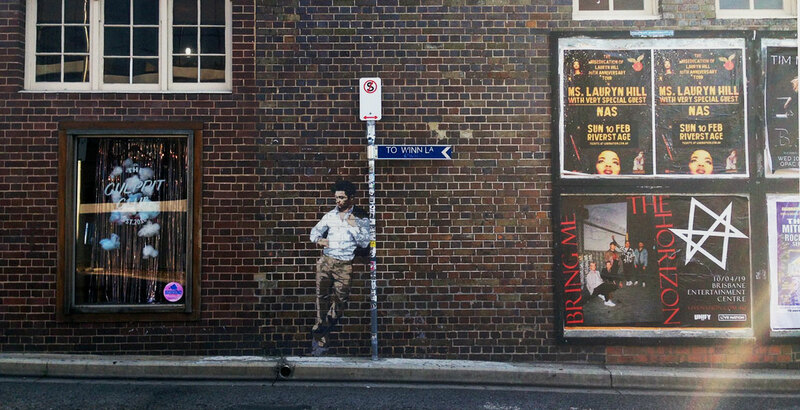 James Street is the tree-lined home to upmarket shopping, fine dining and vine-covered alleyways. Chinatown offers weekend markets, interesting architecture and every kind of noodle dish you’re craving after a few beers. The Valley is a living, breathing animal – always evolving, yet always recognisable. Its personality is full of complexities and contradictions and that’s the way we like it. It’s also full of beer. That’s the way we like it, too. Even though this is youngest venue on the crawl, like the Valley itself Tippler’s Tap has a story to tell. 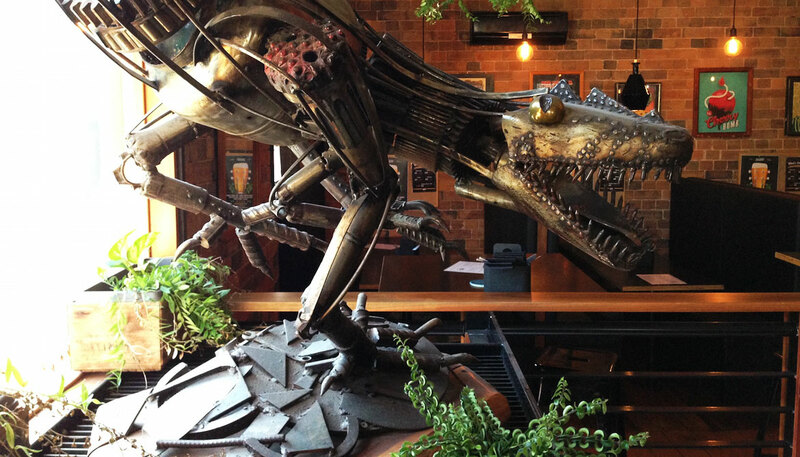 When Brisbane began its late bloom into the craft beer scene, Tippler’s in Newstead (next to The Valley) was one of the first and greatest beer venues. The owners then opened a sister venue in South Bank; the original Tippler’s lost its lease and was forced to close; the new Tippler’s became the only Tippler’s; and then a second Tippler’s opened on James Street in Fortitude Valley, close to the original. Perhaps one day there’ll be a movie about it all. But, for now, we’re just focusing on the present. At any given time, the Valley venue is pouring 14 taps of quality beer, but it becomes even more impressive when you realise every one of those brews is from the Sunshine State, with the Brew Mileage (distance from tun to tap) listed beside each beer. When a bar decides to exclusively showcase beers brewed within 100km of its location – and by no means compromises quality or variety as a result – it’s making a fantastic statement of confidence in the local beer scene. Accompanying the local beers is the Chicago-style food – think deep dish pizza, five kinds of hotdog, onion rings and chicken wings. If you’re after something healthy, head further down James Street. If you want deep fried foods, pickles, and greasy fingers, you’re in the right place. And, despite the fact that there’s heaps of room, and that the walls are covered with tasteful art and brightly-coloured murals… somehow when you approach the bar, you feel like you’re in an underground speakeasy during Prohibition, with alcoved brick walls and gins aplenty. How do they pull off such coolness? Some venues are just born with it. Tippler’s is one of them. Tippler’s Tap is at 2/70 James St, Fortitude Valley, keeping a little bit of grease and grunge alive on immaculate James Street. Right on the fringe of the Valley, sniffing at the border that leads into leafy New Farm, Bloodhound Bar sits patiently (if not always quietly). From the outside, Bloodhound has the look of a two-storey historical corner pub, complete with corrugated iron awnings and wraparound balcony. But, inside, the rustic aesthetic of exposed brick and scuffed timber floors is edged with with band posters, local artwork, a cow skull and a magnificent mural of two pheasants (fighting? playing? mating?) looming behind the bar. Yet even the eclectica can’t distract from the altar of booze that confronts you as you enter the door. While the bartenders at Bloodhound are deadly with the spirits and wines displayed on the back wall, beer is the cornerstone of their expertise. The ten-strong tap list is always well curated, putting forward a spread of styles, breweries, and countries of origin. The exceptions to this are the events Bloodhound puts on to honour a particular style (including Hopfields, their annual tribute to the great humulus lupulus), or the tap takeovers they embark on to help punters appreciate a brewery in more depth. The bottle list is a massive collection that not only contains those rares, weirds and wonderfuls that beer geeks love, but offers incentive to crack them open and share them around by offering more bang for your buck each Wednesday. Upstairs doubles as a live music lounge that’s pumping more often than not, with a secondary bar to keep you hydrated while you’re soaking in the tunes. And, of course, there’s always the balcony for when you feel the need to look out over the Valley like Mufasa surveying his kingdom. Add in the perpetual aroma of Latin American eats (get the tacos get the tacos trust me get the tacos) and the mystery of all the nooks and crannies, and you’ll find Bloodhound’s the bar that keeps on giving. 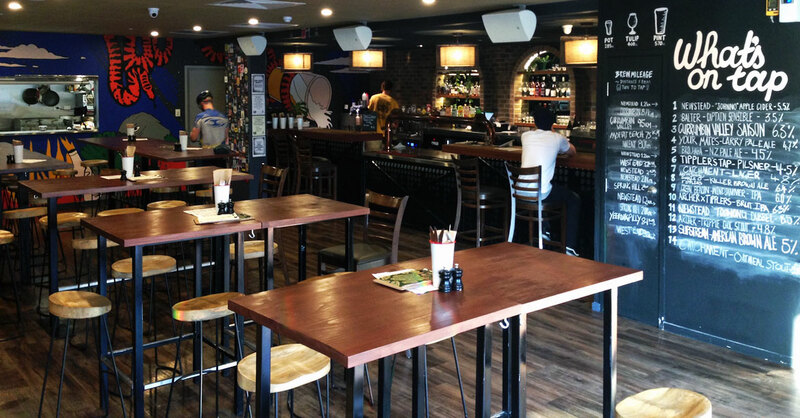 Bloodhound Corner Bar and Kitchen is waiting for you at 454 Brunswick Street, Fortitude Valley. Unlike the eternally droopy face of the dog that shares its name, this bar will make you smile. At quieter times, the cavernous space reveals its slight hunting lodge feel with rough timber planking, Chesterfield leather lounges, chalet-style stonework and a mounted deer head on the wall. But the expansive floor isn’t just there to hold up the walls – at busy times, it hosts hordes of partygoers moving to whatever beat the DJ is dropping. The rooftop garden bar offers more space still, but with a completely different atmosphere: bright colours, astroturf and hanging plants stretch out before a full stage, setting the scene for gigs by touring artists… or for laid-back drinks while playing bocce or giant Jenga. It’s that sort of place. As the neon sign behind one of the bars says: The world is yours. Woolly Mammoth is on 633 Ann Street, Fortitude Valley, next to the equally huge Cloudland. If you’re somehow still not convinced… yes, they have a Woolly Mammoth. Isn’t that reason enough to go there? 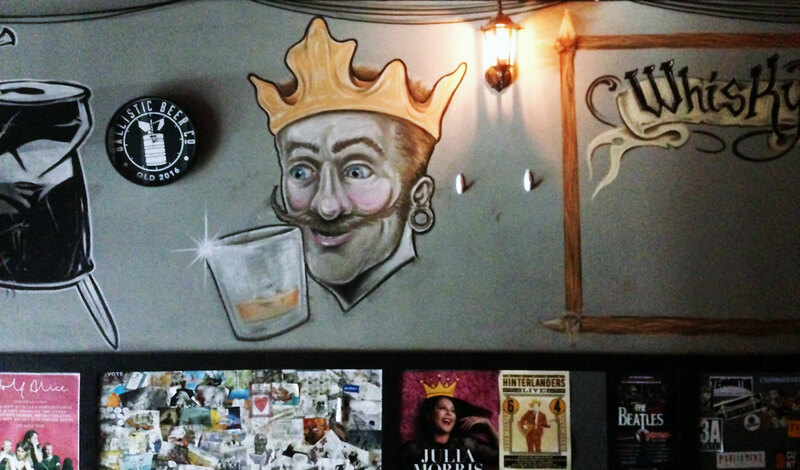 A tiny beer bar called King Lear’s Throne. We’re all asking the same question, right? King Lear is Cockney slang for “beer”. A throne is a toilet, or “can”. Beer can. Hur hur. This place isn’t afraid of dad jokes. Which is apt, because the design style could be described as "Cool Dad Chic”, decked out by owner Ken Parry to suit himself. 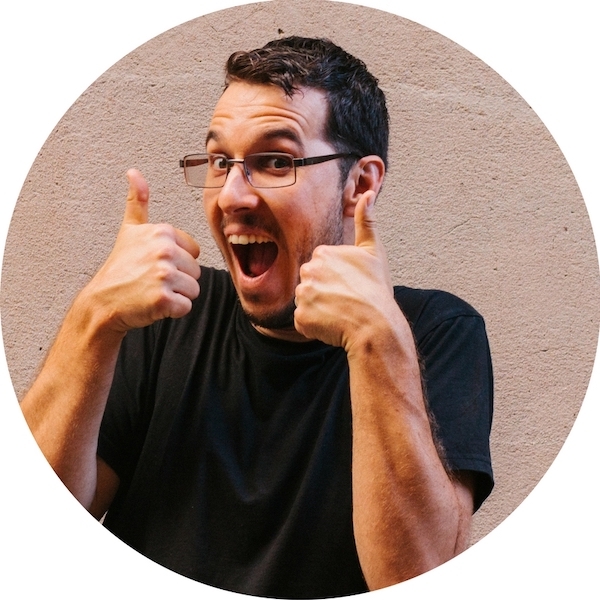 The lighting is the best kind of dingy, like the toolshed in your childhood backyard. The facade is full blackout windows. The tables are pieces of timber attached to black 44 gallon drums, constructed on the day of opening. One wall of the bar – which is about the size and shape of a bus – is corrugated iron and local artwork (which is for sale); the other is posters and graffiti of a crumpled beer can with a sword through it. As you’ve guessed, KLT is all about the tinnies. The rotating list has around 40 cans on it, and it’s as unpretentious as they come. It goes from XXXX and VB through pale ales and craft lagers to Berliner weisse, NEIPAs and IIPAs. You want a can of your kind of beer? No problem. You got it. There are also three shelves of spirits, with an emphasis on whiskies. As the number of whiskies has grown since opening, Ken’s simply built bigger shelves that come out further from the wall. No messing around here. There’s definitely no room for a kitchen, so King Lear’s Throne is BYO food. Bring in a hotdog or order a delivery, and work your way through the can list. King Lear’s Throne is at 3/693 Ann Street, Fortitude Valley. Drop in for a tinnie. Don’t overthink it. If you didn’t realise it already, you’ll know you’re in a good beer venue when you notice the hanging lights made out of growlers (if the oversized Scrabble tiles spelling out BEER didn’t already give it away, that is). The are eight glorious rotating taps to choose from. If you’re ever having difficulty deciding, you won’t go far wrong with whichever one is labelled as Gill’s Pick. There’s also a fridge full of tinnies and tallies, and shelves lined with gins and whiskies. You’ll never run out of bangin’ booze here. If you’re in the mood for food, there are plenty of options… but get a burger. They’re frickin’ delicious. Go with one of the ones on a charcoal activated bun. You’re welcome. The Mill is at 111 Constance Street, Fortitude Valley. Head in, and look up and around, and discover all the little details it’s got to offer. Netherworld is last on this list because it’s an intoxicating mix of familiar and foreign, and it’s the hardest venue on the crawl to leave. This is a den of drinking that celebrates all things monstrous, horrific and supernatural… and also games. Lots and lots of games. 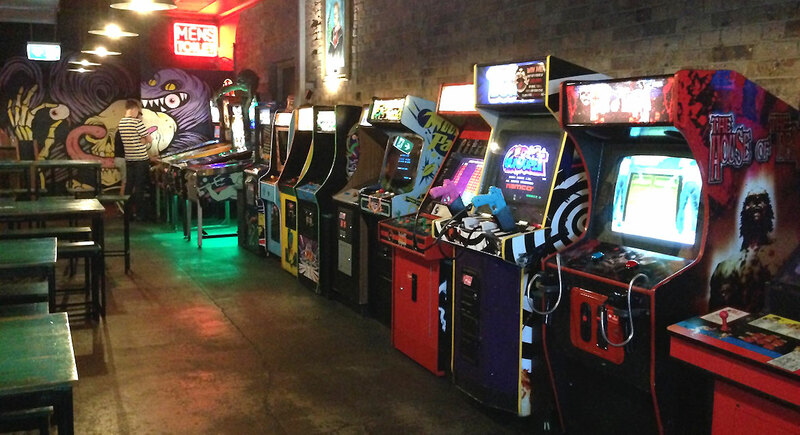 We’re talking rows of arcade games from yesteryear, a flurry of pinball machines, hundreds of board games and card games of all sorts, and a handful of consoles that bring out everyone’s inner child… and all while you’re surrounded by the stuff of nightmares. The rooms are dark and noisy, but so much of the noise is laughter. Demons and beasts and creatures from the deep lurk in every corner, but they’re depicted in neon colours. Perhaps surprisingly, neither the dingy feel nor the horror theme creates a hostile environment. Partly due to the natural warmth of the staff, and partly from intentional culture setting, Netherworld exudes nothing but safety and friendliness. Demographics and subcultures mingle in interesting ways throughout the venue, and there’s a real vibe of inclusivity. The diner-style menu is dripping with weird flavours from Japan, the USA and Mexico. Like everything in Netherworld, it’s a fusion of things you’re comfortable with and things you hope you’re cool enough to try. All menu items are vegan as standard, with cheese or meat options available for omnivores. 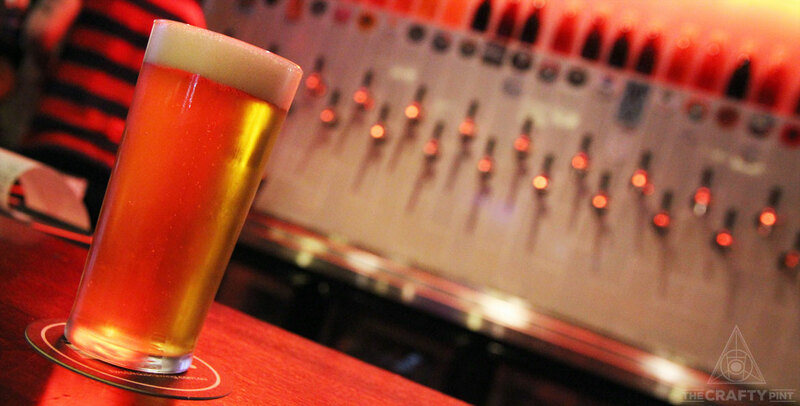 The 24 taps at the bar include a cider, a ginger beer and a few house-made non-alcoholic sodas (which the bartenders are happy to spike for you)… but the rest are craft beers, with a strong focus on local and sessionable. You’re encouraged to drink and play games at the same time, but you must must must use a coaster on the arcade machines or else you’re the worst person in the world. Netherworld is a haven of nerdiness that has to be experienced to be believed. Bring friends and plenty of $1 coins. You’ll be here awhile. Netherworld sits on the corner at 186 Brunswick Street, Fortitude Valley. During busy periods, there may be a line out the door… but it’s worth the wait. Tomcat, 1/210 Wickham Street – live music, a secret whisky bar and plenty of tinnies filled with the good stuff. Ze Pickle, 1 Prospect Street – burgers so crazy good people have been known to get Ze Pickle tattoos and a wide range of fine beer to wash them down. Farrier Bar, 164 Arthur Street – an underground and underrated late night hangout for those with refined tastes. Cellarbrations James Street, 70 James Street, New Farm – head to the back corner and take your pick from an excellent range of local, rare and highly rated beers. You can look out for Stone & Wood's Brisbane brewpub from the end of 2018 too. 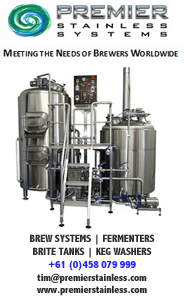 And, if we've missed any good beer purveyors, drop us a line. 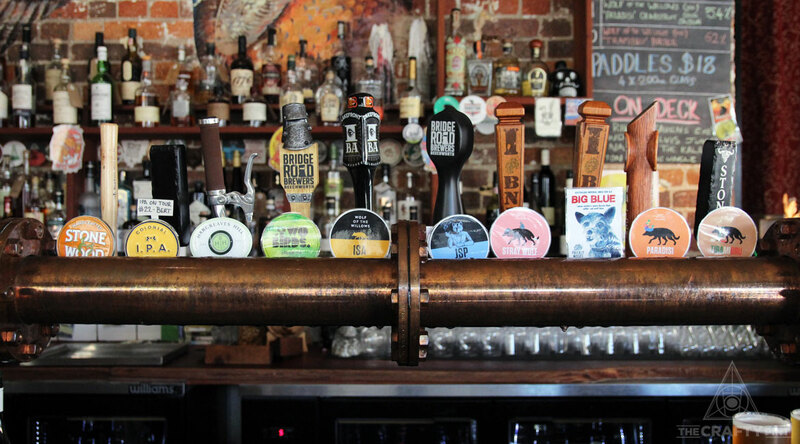 You can download the free Crafty Pint app to find hundreds of good beer venues across Australia while you're out and about and check out dozens of other Crafty Crawls here.